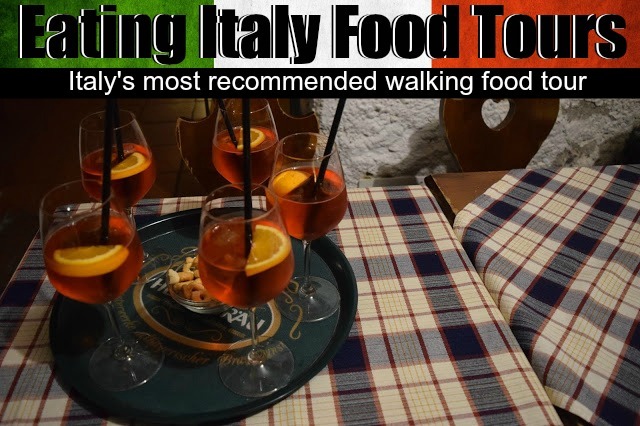 Eating Italy Food Tours are Italy's most recommended walking food tours and operate in Rome, Venice and Florence. They offer lots of different tours including the Testaccio Supper Stroll - a moveable feast throughout Testaccio - which was where Roman cuisine was born. The Testaccio Supper Stroll starts at 5.30pm at Piazza Testaccio. Thanks to the detailed meeting instructions that came with our online ticket, it was super easy to find it: We got off the underground at Piramide and it was a quick 10 minute walk to get to the Piazza. Our evening started off like all good ones do: with an Italian aperitivo - a Spritz: Campari, Prosecco, soda water and a slice of orange. We had ours at a family-run cafe: originally (in the 1900s) this place was a cheap wine bar, that became one of the first places in Rome to sell foreign beer. After our aperitivo we headed to our next stop and learnt an Italian word: funghi - literally mushroom, but in this case used to describe those big outdoor heaters (because they sort of look like mushrooms). We tried two tasty Italian street foods paired with a beautiful crisp Prosecco. The first street food was a Suppli: deep fried risotto in a tomato sauce with mozzarella. This was invented as another way to use up leftovers (in this case risotto). The word suppli comes from surprise, the surprise here being the mozzarella! The other street foods that we tried were deep fried vegetables: artichokes, broccoli, peppers and courgette. Vegetables have always been very cheap in Rome, and indeed the whole of Italy, and deep frying them was a nice, fun treat. Our next stop was for local cheeses and jams. There was a dark bread with onion jam, white bread with Burrata cheese and sun-dried cherry tomatoes from Sicily, Olives from the east coast of Italy, Pecorino sheep's cheese, Fontina cheese and 24 month aged Parmigano. These were paired with a Passerina white wine and a Tuscany red wine. Then it was time for the sit-down pasta meal at Angelina. This restaurant specialises in Rome's famous offal, oxtail and tripe, but as we don't eat meat we opted for a traditional Roman pasta dish: cache e peppe. It was served with a bold red wine. We learnt more about Roman pastas: did you know Carbonara traditionally has no cream? Or that Italians keep back the pasta water in case they need to water their sauce down a little? Our penultimate dish was a Trapizzino - a thick, triangular pizza-bread pocket filled with aubergine and veg. This was my favourite dish of the night. It came with a craft beer served in a honey jar. Our final stop was at a real Italian gelato shop. We tried chocolate and coffee gelato and finished the evening with a traditional Italian digestivo - a Grappa. We also learnt the secret to finding out if what you're buying is really gelato - but we're not going to tell you! You'll have to take an Eating Italy Food Tour to find out for yourself! We learnt a lot about the area of Testaccio on our Supper stroll. Namely that it's a great foody area, not yet discovered by thousands of tourists thanks to the fact it doesn't really have archaeological wonders. And a place in Rome that doesn't boast too many archaeological wonders can still have a 2000 year old pyramid in it! Apparently it was built by Cestius's decedents with the promise that he would make them his heirs. When he did die it turned out that not only did he not have any money, he also left them a lot of debt. Thus they threw his body in the river and the pyramid is empty. Testaccio was also the site of a terracotta graveyard: back in the day, Rome had millions of inhabitants and all of their food was transported in terracotta pots. Terracotta is porous though so after a few uses it starts to break down and become useless. The Romans quickly noticed that dumping the terracotta in the river wasn't a great idea, and thus they created a dumping spot for terracotta. After 400 years of dumping terracotta in this neighbourhood, Monte Testaccio was born (mount terracotta). This is not only where Testaccio gets its name from, but also where it gets its great food rep - as terracotta is cool in summer, they excavated parts of the mountain and stored wine and food there. All the food and drinks we had on our Testaccio Supper Stroll were really delicious, this probably won't come as a surprise as this is Italy after-all, however, it is possible to find bad touristy food stops in Rome, luckily none of them were included on our food tour. But the food wasn't the only highlight, we really loved our guide, Francesco, he was funny, informative, relaxed and fun to be around. He managed to play it just right: informative enough to feel like he was guiding us, but relaxed enough to feel like you were having dinner with a friend. We also really enjoyed the fact that it was only a small walking tour - just us, Francesco and one other guest, Emily. This helped to make us feel like we were 'out at dinner with friends' rather than on a big impersonal tour. As the tour started at 5.30pm, lots of our stops were open just for us - as most Italians don't eat until a lot later, 8pm at the earliest. We always eat 'early' so this suited us well, and it meant that we weren't crowded with other people. All in all, we loved everything about the tour: the perfect amount of food, not too much walking - but enough so you had nice little breaks between eating, great alcohol and fun the whole time! All dietary needs should be mentioned when booking. The Testaccio Supper Stroll is suitable for vegetarians but not for people who don't eat gluten. It is a walking tour, with about 1/4 ish of the time spent on your 'feet'. For those in wheelchairs, it should be noted that there are several stairs to reach one of the stops. We included our Testaccio Supper stroll in our daily vlog, check it out! We absolutely loved our Eating Italy Food Tour, the food was delicious and proved once and for all that there is more to Italian cuisine than pasta and pizza and that it is more than possible to be vegetarian in Italy. To book your own tour, head over to EatingItalyFoodTours.com or book on TripAdvisor. Make sure to follow them on Facebook, Instagram and Twitter! Special thanks to Francesco and Emily for making it such a lovely evening!! And to stay in contact with us, follow us on Facebook, Instagram and Twitter too! Travelling Weasels were invited as guests of Eating Europe Food Tours, but as always all opinions are our own. It was a perfect evening and we hope yours is just as good!